Two years ago this month, Syed Mohammad Ali, in his seventies, died in London. He was not supposed to die. Indeed, there was that kind of energy in him, that particular spirit we define as the life force, which punctuated his being. An abundance of enthusiasm underpinned everything he did, even if it meant being critical of people and ideas he disapproved of. When he died, something of silence descended on those who knew him. I was one of those who interacted with him for years. There was a reason. I married his youngest sister. Which brings back quite a good number of rather amusing memories. When Syed Mohammad Ali and I met for the first time on a winter's day in 1982, there was proper concern written all over him. He had come to study the young man who had fallen in love with his sister, to ascertain (which again was quite understandable) if his sister had a good future with this yet listless man. He invited me to lunch in Old Dhaka, where he would be before going back to London, where he was a busy barrister-at-law. The food was delectable. The conversation was brief. As all romantic tales go, I ended up marrying his sister, to everyone's intense delight. Even Syed Mohammad Ali, resigned to the inevitable, appeared to be joining in the celebrations. In subsequent times, Ali (indeed all his siblings) and I got on famously well. Ali was the second child and first son of Syed Badrudduja, once mayor of Calcutta (in 1943) and then member of the Bengal Legislative Assembly and the Lok Sabha. Like his father, there was exuberance in Ali. He was truly proud of his father but never was there any sign in him of the kind of arrogance which comes to rest on the children of the famous and the known. Ali as also his brothers had inherited from their father a deep love of reading and a propensity for argument. While you might have marvelled at their reading habits, you just might not have been able to agree on their social and political attitudes. From such a perspective, Syed Mohammad Ali had what you might call strong opinions about politics. He was a member of Britain's Labour Party, but that did not hold him back from arguing that, with Blair and Brown in charge, the party was hardly any different from the Tories. My teacher Serajul Islam Choudhury once recounted to me his first impressions of Ali, who would soon become his friend. It was in the early 1950s when Ali migrated to Pakistan and entered Dhaka University as a student. At the students' union elections for Salimullah Muslim Hall, Ali turned himself into a candidate, albeit on the right wing. Choudhury and a few others spotted him addressing a campaign meeting on the grounds of the hall. Ali was dressed in achkan and wore a cap, the kind Mohammad Ali Jinnah wore, and was busy arguing his case before his fellow students. He lost the election, which again was quite natural in those early days of growing Bengali nationalism. His loss was effectively for him a turning away from politics, though his interest in politics was to remain intense till his demise in London. In the heady days of March 1971, as Bangabandhu's non-cooperation movement got underway in East Pakistan, Ali was employed as an assistant editor at The People newspaper. His English was excellent; his comprehension of the Bengali struggle was remarkable. And that is how and why all those scathing editorials calling for a transfer of power to the Awami League appeared every day between the first day of March and the twenty-fifth. The People, being a symbol of Bengali nationalism, was put to the torch in the early minutes of the genocide launched by the Pakistan army. For Ali, after 1971, it would be a trip back to Britain where he had first gone in 1964 to study law. After 1972, it was quite clear that Syed Mohammad Ali would root himself in British society and politics. That was in sharp contrast to what many of his fellow Bengalis travelling to Britain for legal studies were to do. Men like Moudud Ahmed, Jamiruddin Sircar, A R Yusuf and K S Nabi all came back home, to plunge into their profession and/or into politics. There were many who complained about Ali's absence, about his decision to pursue life and a career abroad. But he preferred to live by his precepts. That, on balance, was not a bad thing. Syed Mohammad Ali was a voracious reader. Good readers, he believed, were people for whom the range of subjects to be covered was necessarily wide and diverse. His home was a veritable library and he was forever jealously guarding it. If he loaned out books to anyone, he made sure that they were returned to him in good time. A few days before his death, he made a note of all the books that he had borrowed from Tooting library, an undertaking which made it easier for his children to return the books to the library once he had passed from the scene. Ali's intense reading came through the scholarly in him. He studied religion across the board but never lost his moorings in Islam. Some years before he died, he produced a work which dealt with the position of women in Islam. His liberality came in company with his religiosity in the work. In the 1990s, I watched Ali and his brother Syed Ashraf Ali work diligently on a compilation of the speeches of Syed Badrudduja. That compilation remains an enlightening testament to the formidable politician and orator Badrudduja was till he walked away from politics, or politics went away from him, in the early 1970s. Old songs exercised a deep hold on Syed Mohammad Ali, though he was quite capable, in his enthusiasm, of mangling the tune. Every time my wife and I sang at family occasions, he would join in and sing vociferously, to the delight of everyone present. 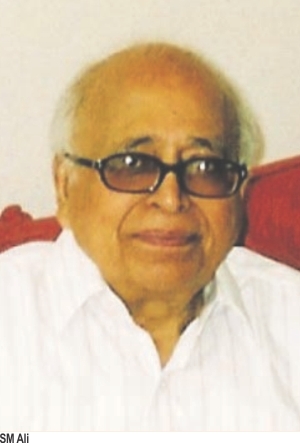 A surfeit of humour, a trait which runs riot in the Badrudduja family, in him was sheer pleasure for everyone who knew him. He loved hearing jokes…and cracking them. And yet when he sang Tagore's din-er sheshe ghumer deshe ghomta pora oi chhaya, it was mortality that flooded into the room, on him and on everyone present. There was simplicity in Syed Mohammad Ali. And it rested on an edifice of humility underscored by conviction. He loved his wife deeply and adored his sons. The values that every Bengali ought to impart to children were values Ali taught his sons and their families to live by. He loved life, of the sort founded on a bedrock of integrity. It was a cold, windy day when we buried Syed Mohammad Ali in London. As we turned to go back home, it was his trademark laughter I thought I heard. I hear that old laughter yet, through the seasons. I see him telling me, all over again, the many stories of how he had come by his huge collection of books. On his final evening alive, he held out his hand for me to shake, telling me he would need my advice on the second volume of his memoirs. Nature intervened and spoilt it all.